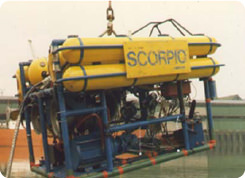 Traditionally, in the realms of both science and engineering, the majority of subsea intervention was performed by divers. 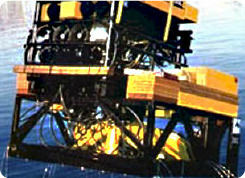 Whether the task was the collection of samples or subsea construction, the activities largely mirrored the surface equivalents. Today, particularly in areas such as marine drilling, there is considerable use of very sophisticated remote control, but this is not robotics, in the sense of the replication of human–like activity. 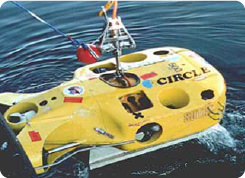 The principal application of robotics in current underwater activity, both engineering and scientific, is the tethered but free–swimming Remotely Operated Vehicle–the ROV. 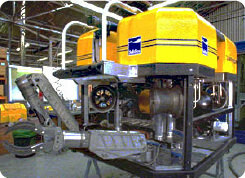 Today’s typical ‘work class’ ROV for the offshore industry consists of a frame which supports the hydraulic pumps, the thrusters, all ancillary equipment (cameras, sonar, etc) and the electronic control equipment, the mass of which is distributed to achieve balance and whose submerged weight is compensate by syntactic foam buoyancy fitted to the upper part of the frame to achieve neutral buoyancy. 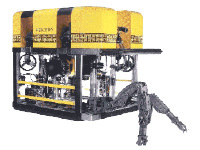 It will be fitted with a five–function grabber arm, used to hold the ROV steadily in one position, and a seven–function manipulator which is used to perform robotic tasks. The manipulator will be a derivation of those found in various industrial applications ashore, having a number of joints, a rotating wrist, and a hand–like claw. For some applications, the ROV will be equipped with a special tooling skid designed to locate and lock on to a docking panel whence various valves and controls can be activated. The ROV is now used for many tasks in the offshore theatre; drilling support, site survey, debris clearance, structure cleaning and inspection, flowline and umbilical tie in, pipeline inspection, route survey, or override of operational functions. However, the offshore industry is by no means the only place where work class ROV are to be found. They have a significant part to play in mine countermeasures, both for survey routes, and for locate and destroy missions when a suspicious object is identified. They are also used for civil engineering work, such as inspection and maintenance of dams, docks, hydro–electric installations and sewer outfalls, and cleaning the hulls for ships without dry–docking. While some of the ROVs are rather smaller, and another important sector is scientific exploration and marine archaeology (who can forget the amazing pictures from the Titanic). There are many large steel structures in the North Sea and the waters of the US Gulf, many of which are getting on in years. As a means of maintaining the cost–effectiveness of these assets, their operators are looking for new deposits to exploiting by tying them back to these platforms. This requires that the integrity of the structures in terms of both corrosion and fatigue is assessed and guaranteed, probably beyond the original design life, and this will require extensive inspection. The detailed inspection of many hundreds of structural nodes, most of which will require cleaning first, is a massive task. It is only really cost effective if it can be automated, and this is likely to be a major application of ROVs in future. The vehicle technology will not have to improve greatly since they will probably continue to be launched near the site with an umbilical for power, but automation of the applications will continue to advance. Systems are already in the development stage whereby the vehicle will fly to a general location, identify the node it seeks, lock on, learn the geometry, clean and inspect. This will require sophisticated robotic arms, measuring systems employing sonar or laser technology, and solid geometry modelling packages. The ROVs will also be task–programmed: in other words, there will not be a pilot at the controls continuously; the ROV will perform the work with only supervisory control.